Welcome to our next gift guide, friends! This is one that I felt was so important for me to do. As a plus size woman, I know when it comes to clothing or shoes, I'm not the easiest person to buy for. And likewise, when it comes to being questioned about what I might want for Christmas, I'm hesitant to direct people towards clothing and shoes because it's not as simple as walking into any store and grabbing a size medium off the rack. 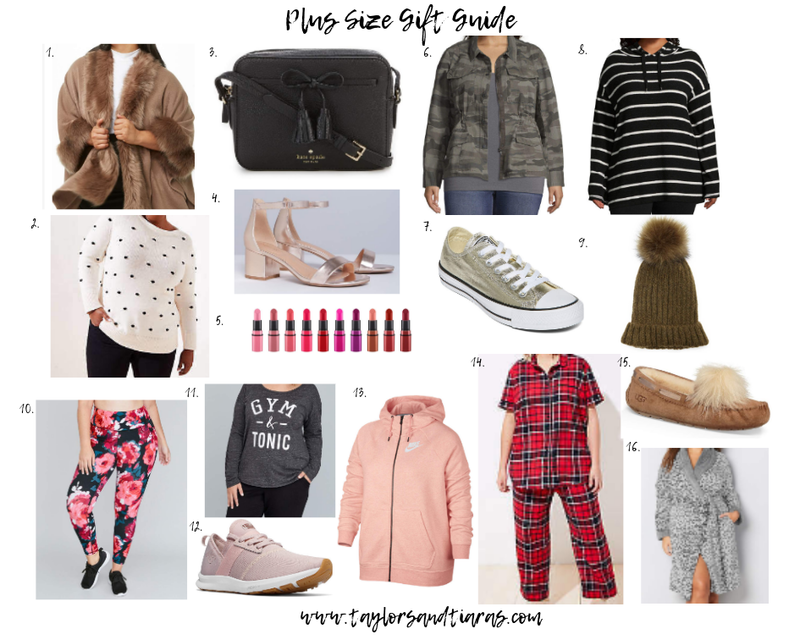 I hope by putting this guide together, it will help my plus size friends not be embarrassed about sharing details regarding size and fit. I also hope it will help those who have a plus size gal to shop for find some new places and ideas to snag the perfect gift. The overall goal here is empowerment - both to give and receive! I want to emphasize that I selected everything here myself. These are brands and styles and products I can recommend without hesitation. The links are affiliate links which means I make a small commission if you order, but this post is not sponsored by any of the companies mentioned. All thoughts and opinions on these items are 100% my own. Although any of these would make a great gift individually, I broke this up into 4 different areas or themes. The upper left corner is geared towards someone who is a little bit glam and girly. The upper right is for someone who loves to be casual and classic. The lower left is for anyone who lives for athleisure or loves to be active. And the lower right has a few ideas for comfy, cozy sleepwear type pieces. Each item has a number and down below I'll tell you why it made the list, and if you click on each item where it's underlined, it will take you right to where you can shop it. Easy.freaking.peasy. 1. Forever 21 Faux Fur Cape This cape is on my personal wish list. Like, for real. I love a good poncho/cape moment so much. These are a perfect gift because the fit is so forgiving on everyone. The faux fur detail makes this something that will not only look incredibly stylish and expensive, but add extra warmth. And because it's from Forever 21, it keeps the price reasonable. It would probably cost twice as much at a department store. If you are shopping for someone who is plus, steer clear of pants and tops at Forever 21. Outerwear like this is a great choice. 2. Loft Bobble Stitch Sweater I have praised Loft before on the blog. 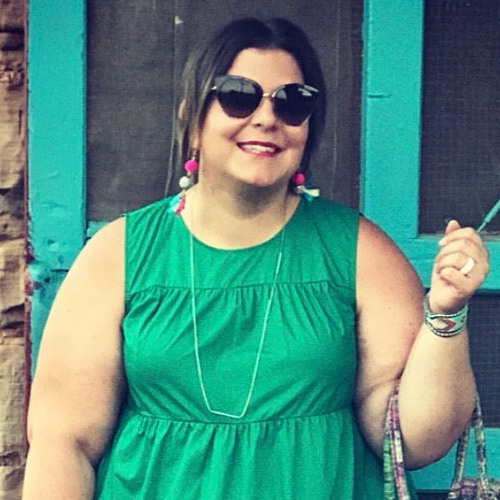 They ventured into plus size clothing earlier this year and nailed it. Select stores are beginning to carry the pieces, but you can always order online. The fit and sizing are great at Loft, and that's why I felt comfortable including this sweater. (A good rule of thumb for all traditional sweaters, if you're unsure, is to size up.) By the way, this sweater is everywhere in the world of blogging and Instagram right now so it's not just me who thinks it's amazing! Black and white is so classic, and the little dot details make it fun and special. 3. Kate Spade Crossbody w/Bow Detail This gift is in a higher price point, but I had to include it because I know there are handbag hoarders like me out there! This would obviously work for anyone of any size, so give it freely my friends. The bow detail is so cute and anything from Kate is always a gift to be treasured. 4. Lane Bryant Metallic Heeled Sandals Shoe lovers, this one is for you. No matter the season, you always need a pair of shoes you can wear for dressy events and these are fabulous. These could also be paired with jeans honestly, and a metallic neutral goes with every little thing in your closet. If you're buying shoes for someone who is plus, know that we don't all have a wide foot. Some plus ladies are absolutely fine in shoes from any brand in their regular size. But if you know someone who needs a little extra wiggle room, Lane Bryant shoes are always a win. 5. MAC Shiny Pretty Things Lip Kit This is another gift that is perfect for anyone, of any size. MAC lipsticks have always been at the top of my favorites list, and this has every color you could ever need. If you do have a glam girl or someone beauty obsessed on your list, she will love you forever for this! 6. JCPenney Camo Utility Jacket I have a jacket that's very similar to this, and each time I wear it, someone asks me about it. The reason I'm not afraid to put this on a gift guide is because this cut of jacket typically runs true to size and has a very flattering cut. It's tempting to buy one at less expensive stores like Ross, but the sizing may be a bit off. I have multiple utility jackets and vests from JCPenney and the fit is always true to size, if not a bit generous. This particular jacket also comes in a variety of colors if camo isn't your thing. 7. Metallic Gold Converse Chuck Taylors I own this very shoe in this very color, which makes it a no-brainer for this list. Chuck Taylors are a Converse classic, but they get a super fun twist in this metallic gold color. I wear them with everything from jeans to dresses. Even though my feet are on the wider side, I've never had an issue with Converse. I promise, this is a winner in the gift department! 8. JCPenney Striped Hoodie There's this really icky, out of date myth that plus size women can't wear stripes. FALSE. Plus size women can wear anything they want to, and that includes stripes. This soft, casual hoodie is perfect for layering and because it's meant to be soft and oversized. That also means it's easy to feel good about gifting it to someone because you don't have to worry about buttons, seams, or anything being too tight. If you really want to make someone happy, get them all 4 pieces of the casual and classic section because they could all be worn together for an easy, pulled together look. 9. Forever 21 Faux Fur Pom Beanie You really can't go wrong with cold weather accessories as gifts. This beanie has the cutest faux fur detail and I can't think of a better neutral than olive green. This is the perfect add-on gift to pair with something else because it comes in under $10 but it packs a big punch on style. 10. Lane Bryant Floral Leggings Over and over again, I go back to Lane Bryant leggings. They're just a staple in my life. Honestly, if loving athleisure clothing is wrong, I don't want to be right. These leggings are so cute and so fun, and because they're from Lane Bryant, I can assure you the comfort and fit will be fantastic. These are perfect for someone who just wants to be comfy at the grocery store or someone who is at the gym every morning. In fact, they're probably going on my own Christmas list, y'all! 11. Lane Bryant Gym & Tonic Sweatshirt Despite what you may have heard, there are plenty of plus size ladies at the gym simply because they want to feel good and be healthy and NOT because they're desperate to be skinny. But, there are some ladies in the gym putting in hard work, transforming their bodies, and they deserve love, too. Bottom line, if you or someone you know is up in the gym workin' on their fitness, they need this super cute sweatshirt in their life. Period. 12. New Balance Athletic Shoes If you've made it to this point, then you know I have a somewhat wide-ish foot and not every shoe works for me. Some plus gals have the same issue. Enter New Balance. Where Nike sometimes fails me, New Balance picks up the slack. Their athletic shoes are comfortable, have plenty of width without having to buy a "wide," and this blush color is to die for. Really, what more can you ask for in an athletic shoe? Nothing. 13. Nike Zip-Up Hoodie Traditionally, it has not been easy to find active wear in plus sizes. And there certainly hasn't been a big plus selection within the brands most folks know and wear on a regular basis. However, in the last year or two, Nike has come to play ball - literally. (Cheesy pun totally intended!) This pink zip-up is something just about anyone would love to wear, and all my Nike purchases to date have been a success. Again, add it to my list! Haha! 14. Loft Plaid Pajamas These pajamas are so dang cute. That's all there is to it. I don't know anyone who wouldn't love to get these adorable plaid PJs. All the Christmas feels for these...but I would still wear them year round! Pro tip: Add a monogram to the top to make it extra personalized and thoughtful. 15. Ugg Pom Slippers This is another gift with a more luxury price tag, but they are so good. I got these in a dusty pink color last year and they keep my feet so warm and comfy. I have found that I can wear my true size in Uggs and over time they just kind of mold to your foot. If you want to spoil someone this year, these are a great way to do it. Plus that pom? I die. 16. Fuzzy Plaid Robe I know a robe sounds boring, but this one is absolutely not. It's specifically plus size so don't have to worry about it gaping open in unfortunate places, and it's leopard print. (Again, a perfect piece to monogram if you're into that. I totally am.) It's comfy, cozy, and chic. Not every robe can do that. This one can. So that's a wrap on my plus-size gift guide. If you enjoyed it or found it helpful, I'd love to know! This was really fun to put together and if it helps even one person have a better gift buying or receiving experience, then it was worth every bit of time and research. Have a fabulous day, and I'll see you back here soon! Love your picks! Im a size plus girl also and these are so helpful! Totally ready to shop!! So glad you enjoyed! Thank you for taking time to read! This is great your blog is amazing and easy to read love how informative your posts are! Your doing awesome work!